Poly Bags are made of polyethylene, and can be used for a variety of uses. 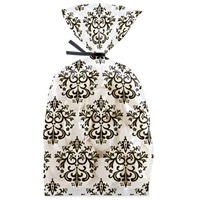 Package soaps, bath salts, bubble bars, and more in these bags. 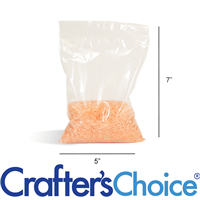 The zip close poly bags are versatile, and can be used to keep your soap space organized. This bag measures 4" x 9.5". 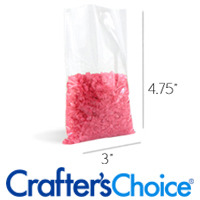 The set comes with 20 bags and 20 twist ties. 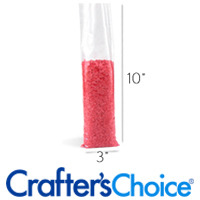 Great for favors and crafts. 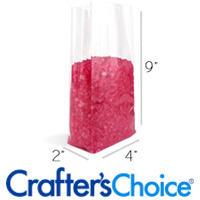 FDA approved for food contact. 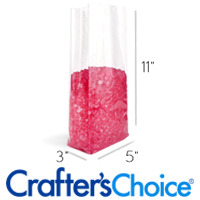 Great for favors and crafts. Pleated Gusset for extra space. FDA approved for food contact. 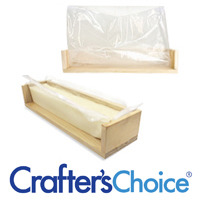 Crafters Choice™ Clear Poly Bags - 20.5" x 3.75" x 15"
This bag has been specifically designed to fit the Crafter's Choice Wooden Soap Loaf Mold. The heavy-duty 3 mil plastic is perfect for cold process soap making, hot process soap making, and melt & pour soap projects.